William started out in boating from a young age, gaining valuable experience working with several Dive Schools worldwide as an Assistant Dive Instructor and Dive Boat Captain. William was a keen sportsman throughout his youth, however a sporting injury bought any promise of a future career in Rugby Union to an end, resulting in him enrolling at the University of Greenwich in London where he achieved an admirable First Class BA Hons in Business Studies. As part of this degree, William completed a one year work placement with Sunseeker London. This opportunity to experience and gain insight into all aspects of the business further enhanced his knowledge and passion for the yachting industry. Upon graduation in 2008, William returned to Sunseeker London as part of the sales team and has since developed an excellent knowledge of the Sunseeker yacht range as well as a solid grounding in the marine industry as a whole. 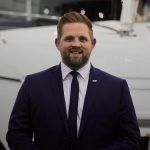 With a strong passion and drive to succeed instilled at an early age, William has been fundamental in the rapid development and success of the Sunseeker Brokerage Division for the group as well as the more recent development and operation of Sunseeker Italy SRL.